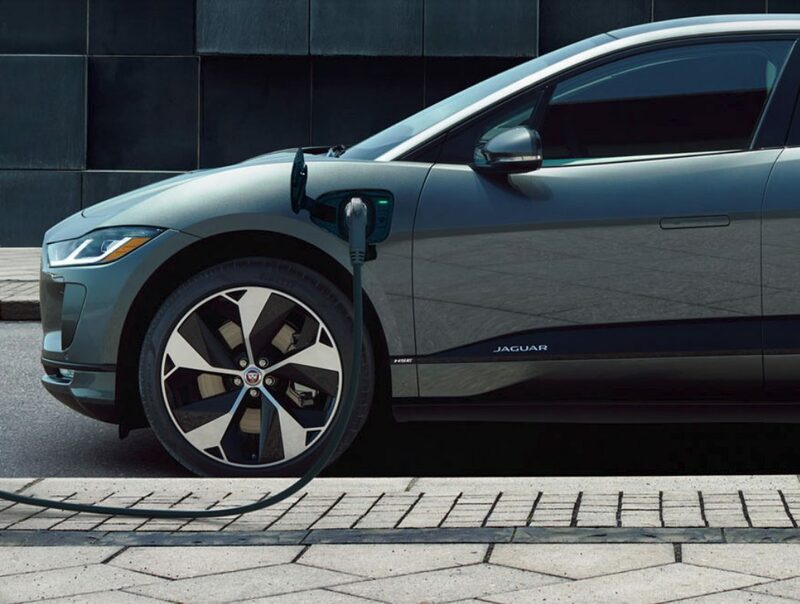 The new Jaguar I-Pace is a battery-electric vehicle (BEV) crossover with two rows. It is similar in size to an Infinity QX50, and has roughly the same interior capacities as a Mazda CX-5 or BMW X3. The I-Pace is unique in the American market since it is an all-electric, all-wheel drive crossover with two rows. It is also the only BEV crossover for sale in this country on top of which you can place a bike rack or Kayak rack. Sorry, gullwing Tesla Model X. There really is no direct competition for the I-Pace. Yet. We will add that the I-Pace is a premium/luxury vehicle. Ours had almost every option we expect in a premium/luxury vehicle, including a couple things Tesla will not sell you. Jaguar is offering the I-Pace in a base version starting at about $71,000 and a top-trim First Edition starting at about $87,000. Our well-equipped I-Pace 400EV HSE had an as-tested price of $89,310. However, we would apply a “cost to buy” price of about $75K for this vehicle as we explain lower in our review. Let’s jump to the good part here. The I-Pace pulls stronger than any vehicle this tester has ever driven, and among the few cars we would say are even close we’d list the Dodge Hellcat and Nissan GT-R. EVs now own performance, and dancing around that fact diminishes their single biggest advantage over internal combustion engine (ICE) vehicles. With 512 ft-lb of instant torque and all-wheel drive, only Tesla’s more expensive vehicles are really comparable. Drive along and peg the power pedal and the punch feels unlike that delivered by any liquid-fueled street car. Jaguar says the I-Pace runs to 60 MPH in about 4.5 seconds (quicker than the pricier Tesla Model X). Which is plenty fast for any road in America. Jaguar also says that if it had chosen to make the I-Pace quicker, that time could have been under 2 seconds. Passengers we took for rides could not believe the acceleration. The I-Pace is totally sorted out. Jaguar has nailed the handling and ride comfort in our opinion. The vehicle feels substantial like a large sedan does, but driving it is more fun. It corners flat and hangs on even in serious turns at speed. The (adjustable) ride height does nothing to spoil the handling. What’s more impressive is the superior ride quality. The I-Pace is not stiff like many sporty vehicles, yet is tight in its handling. This is the hardest trick in the automotive business and Jaguar does it as well as anyone. The seats* of the Jaguar I-Pace EV400 HSE are sport buckets that look great and offer real comfort. Power adjustment is there, of course, and the leather is of excellent quality. Remember, Tesla won’t sell you a vehicle with leather seats. Our seats were both heated and cooled. Getting in and out is easy thanks to the slightly higher ride height compared to a low-slung sedan. Rear seats offer plenty of legroom for adults, and the front seat passengers won’t need to pull their seats forward of the rearmost setting more than an inch or two. 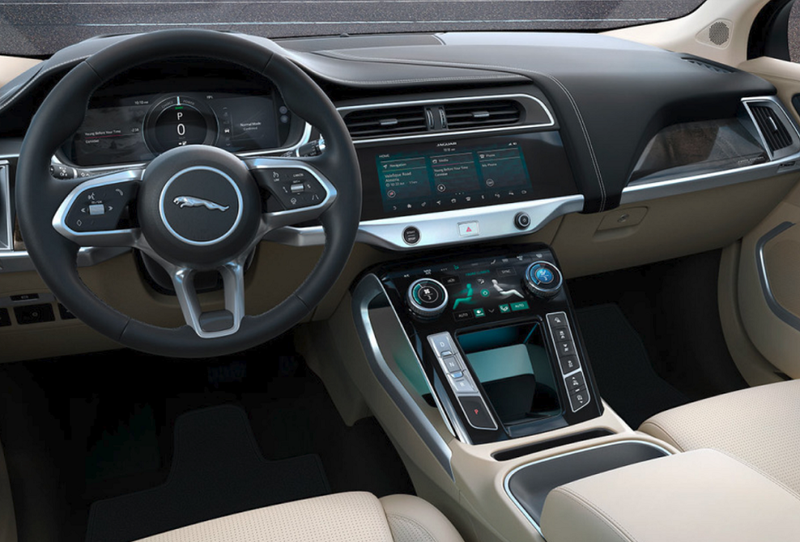 The I-Pace EV400 HSE comes with a very good audio system complete with SiriusXM, Bluetooth, and Android Auto / Apple CarPlay. The Android Auto worked perfectly. You won’t find that in any BMW or Lexus. 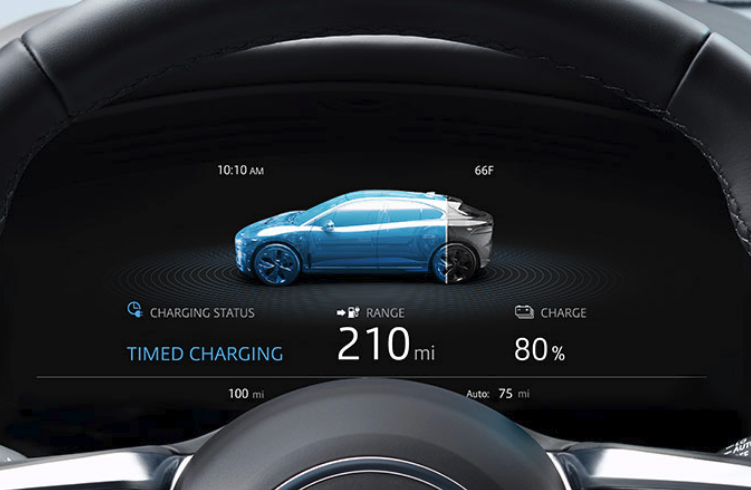 There is also a multi-color head-up display and a TFT gauge screen area in addition to the large, clear main touch screen. Jaguar’s infotainment is the best in the luxury car business and here it shines. No silly mouse to learn, easy menus, everything is adjustable, and you won’t need a manual. The one tricky thing we overcame was figuring out how to turn on the heated and cooled seats (You pull up or push down the rotary temp knob). Behind the rear seats the I-Pace has a storage volume of about 25 cubic feet. That is midway between a Subaru Crosstrek and a Mazda CX-5. However, it is partly due to the low-slung roof. If you need a taller cargo area, consider the E-Pace. The specs are deceiving here. The cargo area could easily hold three golf bags or two hockey bags. Dropping the seats adds considerably to the volume available. Just as we discuss fuel economy for the liquid fuel internal combustion engine (ICE) and hybrid vehicles we test, BestRide offers our experiences with EVs and their attributes. The I-Pace has a good total EPA-estimated range of 234 miles. At our home base, only 115-volt power was available so the I-Pace only recouped a few miles of range per hour on the charger. Owners should plan on having an electrician install a dedicated hi-amperage charger which will add range much faster. During our travels, we did plan to stop and recharge at a public charger in Cambridge Mass. on the MIT campus. However, when we arrived at 10 am on a Sunday, the two charging spots were both taken by a Volt EREV and a Honda Clarity PHEV. Both of these cars can charge from empty to 80% in under 15 minutes on a public charger, However, during our testing of EVs, we continue to find that EV owners don’t actually treat these public power supplies as chargers, but as parking spaces. When we left at 1:30 both were still occupying the two power connections they hadn’t been pulling juice from for hours. 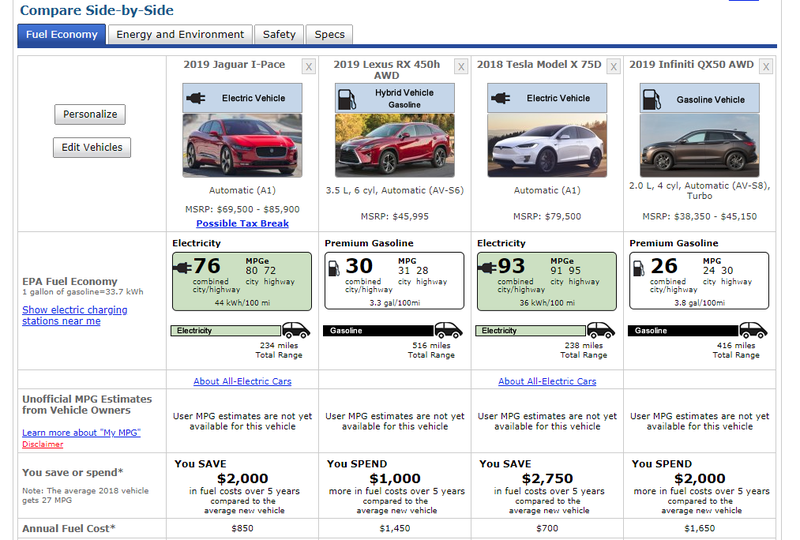 We did notice that the I-Pace is similar to other EVs that we have tested in that its range estimator is very optimistic. 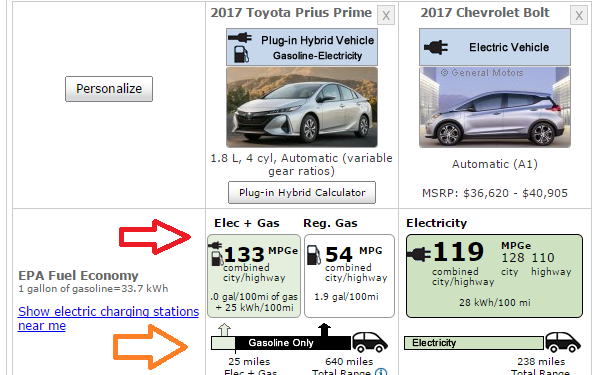 “Range miles” disappear a bit quicker than do actual miles. 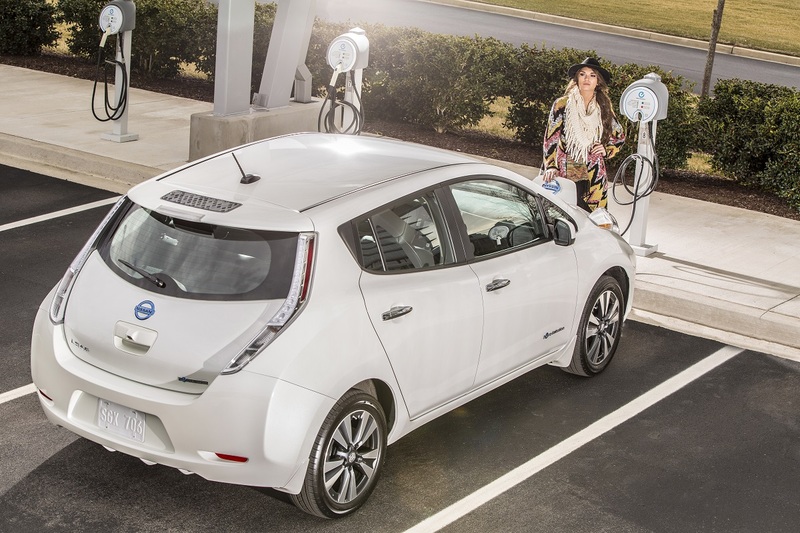 The last Nissan Leaf we tested had the same sort of range behavior. Based on our experience, it is always wise to profile an EV to get a feel for its true range capabilities and learn how heating, cooling, and preconditioning can affect the actual range before testing its limits. The I-Pace’s owner will be eligible for the full $7,500 federal tax credit. Also, most EV-targeted states offer cash rebates. Our state of Mass. offers a $2,500 rebate at registration. By comparison to a hybrid crossover like the top-selling Lexus RX 450h, the I-Pace will use about $600 less in fuel each year. Pull all of these cost savings together and the I-Pace we tested would have an adjusted cost of about $ 75,000, not including any discounts by Jaguar’s dealers. Unlike Tesla’s never discounted direct-sales, Jaguar dealers can discount the vehicle price if they so choose. 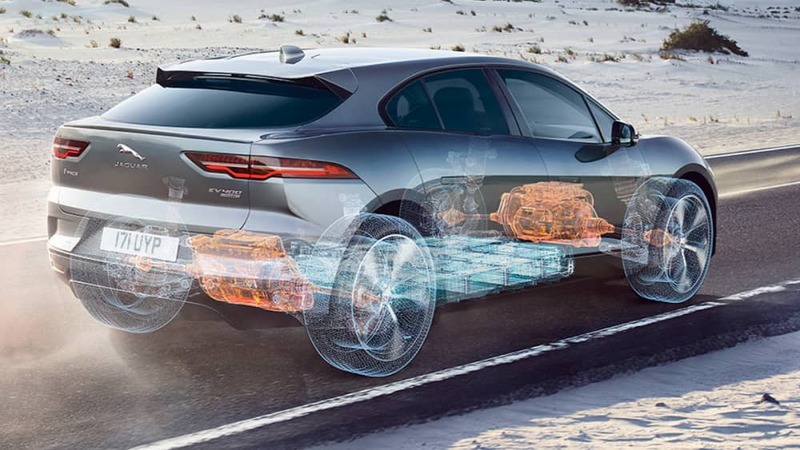 Jaguar’s unique included maintenance plan and its unusually long comprehensive warranty are the best in the business. That has added value we have not included in our adjusted cost. Neither IIHS nor NHTSA has tested the I-Pace yet. The I-Pace does come standard with all of the expected active driver aids. To this reviewer, a Jaguar is something special. Not an ordinary vehicle, though the company certainly has vehicles one can drive daily in any situation. Jaguars have always been known for quick reflexes, handling prowess, and to some degree speed. Jaguars are also premium vehicles, but not flamboyant and over the top with gadgets and gimmicks. With that in mind, it is hard for us not to call the I-Pace Jaguar’s best vehicle. We adore the F-Pace. We drool over the F-Type. We have been fortunate to test nearly all of Jaguar’s modern vehicles and found they all have the elements that make a Jaguar special. 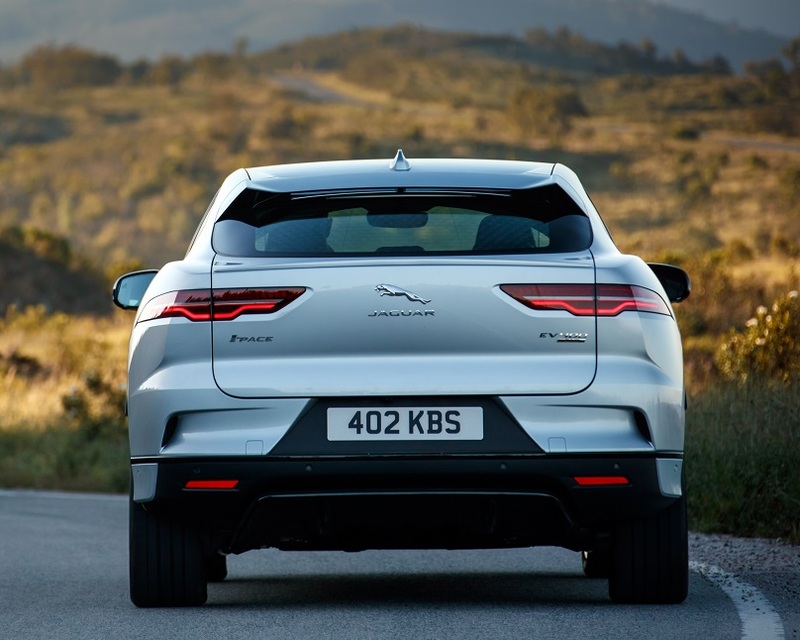 What struck us as most interesting during our testing was that the new I-Pace electric crossover from Jaguar didn’t just have these elements, it seems to possess them in a higher concentration than in its siblings. The I-Pace is as comfortable as Jaguar’s best sedans. It is as quick as an F-Type in the real world. It has the all-road capability of an F-Pace. All this, and with zero tailpipe emissions. We’ve been waiting for a great premium all-wheel drive two-row electric crossover, and Jaguar’s I-Pace has exceeded our high expectations. *Image Notes – Please note that some images shown are of other I-Pace trims.